Our 50th Reunion was a Great Success!!!! of our classmates have posted their photos and videos. to our Facebook Group to see the many photos and videos. Here is the 50th Reunion Photo Page link. we attended the meal, music, visiting, and dancing in the recently restored 1930s era Settles Hotel Ballroom. The YouTube Video is by classmate John Fierro of that event and the beautiful 1930s period correct restoration of the Settles Ballroom. Note the 1930 period correct fans on the walls. 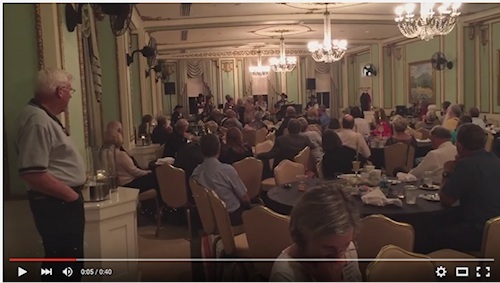 The Video Image Above is a link to the Ballroom video on YouTube. Click on the image to view the video. Thanks to John Fierro.